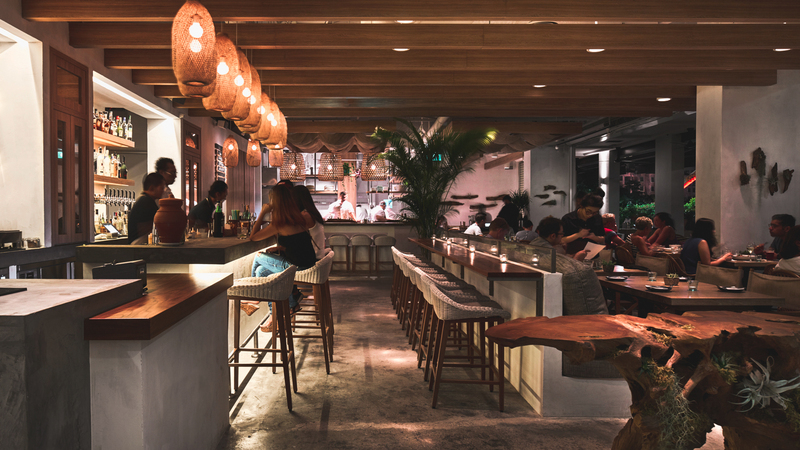 THERE is indeed a great catalogue for bars to frequent in Boat Quay, but if you’re also looking for some good chow to feast on in the area, here’s where to get some yum in the tum. Sitting right at the heart of the new, revamped Quayside neighbourhood is city beach café and bar Summerlong, offering an eastern Mediterranean cuisine with beachside, chillax vibes. Our palates are always in flux, which is why the kitchen at Summerlong, along Robertson Quay, is whipping up their newest dinner menu, offering new yet simple flavours that promise to satiate even the most demanding of taste buds. It’s offering a lot of the good stuff, but we’re going to give you 5 menu items you’ll love at Summerlong at Robertson Quay. A must-try for starters is the corn fritters with goat cheese and avocado dip. An assortment of coriander and herbs are mixed with sweet corn and rice flour into quenelles, deep-fried just the right amount of time to achieve a delightful consistency — crispy on the outside, soft on the inside. Most of all, they have a Mezze Platter, so order that, and you get to have it all with both the classic and eggplant hummus with vegetable sticks, flatbread, smoked olives and the corn fritters as well. In its latest dinner menu is a dedicated BBQ seafood section, catered to showcasing the freshest catches from the sea. One of the must-trys includes this squid dish, with it’s soft yet chewy texture a pleasure to masticate on. On the first bite, the smokey char from the charcoal-grilled flesh lands on your taste buds. As the meat gets worked on in the mouth, you’ll be able to appreciate a sweetness that’s elevated by delicate notes of spice from a generous dusting of Turkish spices, paprika and chilli powder. The aroma soon coalesces, as the chewiness of the meat is finished off with a zest of tangy lime. There is no fishiness detected in the dish, too. Given how fresh the squid tastes, it’s no surprise the multi-layered taste ensemble shines through with ease. We’ll say this much: If you ain’t ordering this, it’s your loss. While the Kale Tabbouleh has been a crowd favourite, we also recommend the pork kofta kebab salad with its perfect blend of Ottoman-spiced pork and fresh kale for those who appreciate the gratifying flavour of grilled meats amidst the crisp yet soft spears of greens. It’s always an awkward relationship between meat-eaters and salads, but even they will have happy tummies with Summerlong’s options, like its toasty kebabs on fresh kale and romaine salads, or with saffron rice, grilled tomatoes and pita. There is no better way to end a meal full of fresh catches from the sea with a sinful sticky date pudding. This dessert offers a different experience from the brownie and ice cream combination it looks similar to. With its moist pudding juxtaposed by the crushed hazelnut praline, a harmony of soft and crumbly sits atop a pool of sweet lemon butterscotch; easily one of the guiltiest of pleasures on the menu. Those with a lighter palate can also indulge in the Greek doughnuts, accompanied by pistachio ice cream and drizzles of a dukkah swirl. It offers those with a sweet tooth a play on textures — a cold and smooth, creamy sweetness first blends with the granular dukkah. Together, they envelop the warm fried dough, its aroma further enhanced by the doughnut’s lightly toasted texture. Yummm. Summerlong offers a relaxing ambience to soak in Mediterranean beach vibes, the perfect setting for merrymaking banter with friends and family. All the more to wash down the good times with a mocktail of theirs, or a “non-tail” as they call it, like the fruity Achilles Fizz, made with passion fruit, sour plum and bubbly soda. If alcohol is your beverage solution, then go for the Gin Remedy with a peachy zest for that sweet punch, or the Aperol Spritz should you fancy a heavier kick.